Unique Packaging Systems an unparalleled name in presenting premium quality Packaging Machines to it's clientele. These machines are widely used for packing various flowing and non-flowing material like Snack Food, Seeds, Nuts, Coffee (granules/ beans), Tea, Sugar, Grated Cheese, Bakery Products, Candies & Confectionery, Rice, Nuts & Dried Fruits, Spices, Pasta, Pet Food (pellets) etc. Manufactured under the strict observation of our professionals with the implementation of cutting-edge technology, these machines can be availed from us in numerous specific options in order to fulfill the need of our clients. Moreover, these Packaging Machines are stringently tested on certain parameters to ensure their robustness prior delivery. MULTI HEAD COMBINATION WEIGHER High Speed & High Precision weighing is the uniqueness of multihead weigh filler. 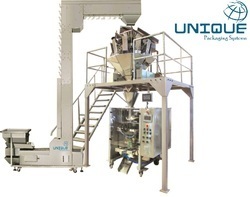 UNIQUE series is well known for its pouch finish & sealing intactness which prevents leakage of inert gas from pouches & gives extended product shelf life.Main function Completely automatic weighing, filling, film-pulling, bag making and sealing, nitrogen gas filling, printing, and quantity-counting. APPLICATIONS:-Highly Suitable for :- Snacks, Kurkure and Potato Chips, Farsan, Chiwda, Namkeen, Dry - Fruits, Pulses, Grains, Tea, Sugar, Seeds, Frozen cut vegetable etc. Highly Suitable for :- Chips, RICE, Kurkure and Potato Chips, Chiwda, Namkeen, Dry-Fruits, Grains, Tea, Sugar, Seeds Etc.